Edward Lester Henshaw1,5,6,7 [Lester Henshaw2]. Henshaw, Lester, age 32, born in New York; carpenter; $500 personal property. Henshaw, Hannah, age 26, born in Ohio; keeping house. Henshaw, Zelda, age 6 months, born in Ohio. 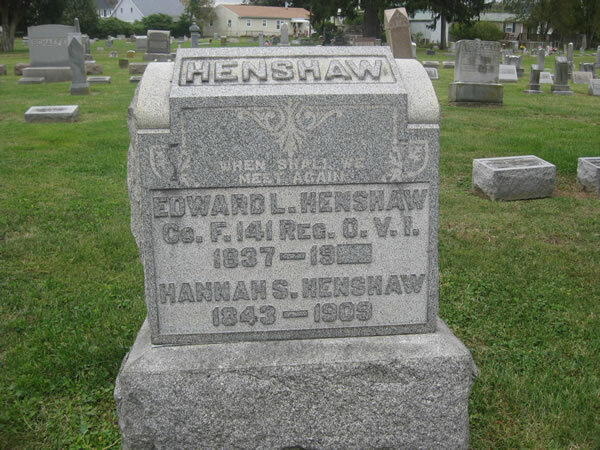 Hanshaw, Edward L., head-of-household, age 82, born in New York; father born in Connecticut; mother born in Pennsylvania; widower; rented home; occupation: carpenter, home. Hanshaw, Emma, daughter, age 50, born in Ohio; father born in New York; mother born in Ohio; widow; occupation: none. RootsWeb WorldConnect GEDCOM from Darienne Hall (). 1920 census, Gallipolis, Gallia County, Ohio; roll T625-1385, ED 51, page 3B, line #62, dwelling #73, family #78.